The markets for Prevora are new but pent-up, and immense. 125 million older adults in North America and Western Europe are experiencing poor oral health or have several risk factors for developing this medical condition. 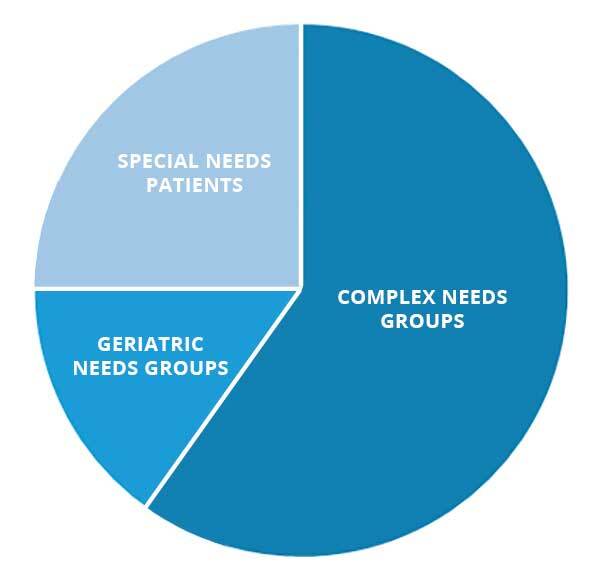 This accounts for between 15% and 20% of the adult community and includes those with emotional, learning or physical disabilities. The Center for Disease Control estimates there are 61 million Americans have Special Needs. Those with multiple-chronic conditions, which involve 1 in 4 adult Americans. There is another critical dimension to Prevora’s market opportunity. Science is now reporting chronic disorders such as Type 2 diabetes, hypertension, cognitive decline and COPD can be improved with better oral health. This means managing oral dysbiosis with Prevora, could become an important adjunctive treatment in chronic disease management. We are currently proving this possibility in several ways in the family medical practice, in the retirement residence and in the hospital setting.